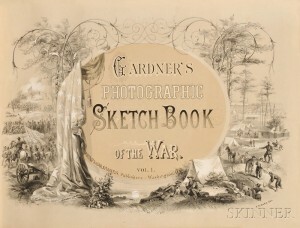 Fine Books & Manuscripts Auction | Early Photography | Exceptional Results | Skinner Inc.
19th century photography performed well, led by Alexander Gardner’s Photographic Sketch Book of the War. Skinner’s complete offering of this evocative 1866 work, containing one hundred photographs of important landmarks, battlefields, and incidents of the Civil War was the auction’s top lot, selling for $192,000. Another remarkable photography highlight was a group of eighty-four images of the American West by Andrew Russell, c. 1869 , fetching $174,000 after a heated bidding session, and smashing the pre-sale high estimate of $5,000. Many of these stunning images, documenting the progress of the Trans-Continental Railroad amidst impressive natural scenery, were published in Russell’s The Great West Illustrated in a Series of Photographic Views across the Continent. Further demonstrating excitement for photographs of the American West, Thirty Photographs of the American West and Mexico, by William H. Jackson, c. 1880 sold for $10,700. A later photographic offering, a group of framed black and white photographs depicting an automotive crossing of North America, c. 1910 brought in $1,320. Spotlighting the early days of the beloved automobile, this unique collection handily surpassed the high estimate of $300. From established collectibles by Audubon, to obscure medieval texts, the November 17th auction realized robust prices for books. Two of Audubon’s works featured in the top ten, including a first octavo edition of Audubon’s The Birds of America, which sold for $36,000. 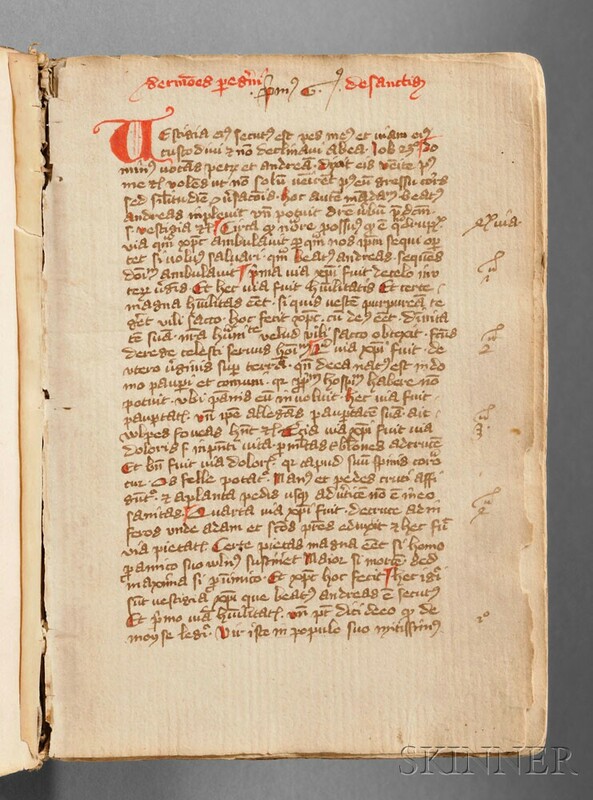 Illustrating an emerging appreciation for text manuscripts, once largely the realm of scholars and monks, a Medieval Latin text manuscript containing popular sermons, fetched $42,000. The ever popular author Ayn Rand also appeared among the auction’s lots. Two volumes inscribed to classical music figure Deems Taylor, Atlas Shrugged and For the New Intellectual, far exceeded the high estimate, selling for $10,200. Gray explains this lot’s appeal as a factor of not only Ayn Rand’s following, but also, its association with a second well-known individual, Deems Taylor. Skinner auctions draw international interest from buyers and consignors alike, with material regularly achieving record prices. The company’s auction and appraisal services focus on fine art, jewelry, furniture, and decorative arts from around the globe, as well as wine, important musical instruments, rare books, clocks, Judaica, and more. Monthly Skinner Discovery auctions feature a breadth of estate material. Widely regarded as one of the most trusted names in the business, Skinner appraisers have appeared on the PBS-TV series Antiques Roadshow since the show’s inception. Skinner has galleries in Boston and Marlborough, Massachusetts, with an international audience of bidders participating in person, by phone, and online through the SkinnerLive! online bidding platform. For more information and to read our blog, visit the Skinner website at www.skinnerinc.com, find us on Facebook at https://www.facebook.com/skinnerauctions, or follow us on Twitter @Skinnerinc. This entry was posted in News and tagged Alexander Gardner, american west, Andrew Russell, auction results, audubon, books auction, Civil War, civil war photography, Devon Gray, early photography, Emily Dickinson, George Washington, literary history, medieval manuscript, natural history prints, presidential documents, rare books, rare manuscripts by Skinner. Bookmark the permalink. 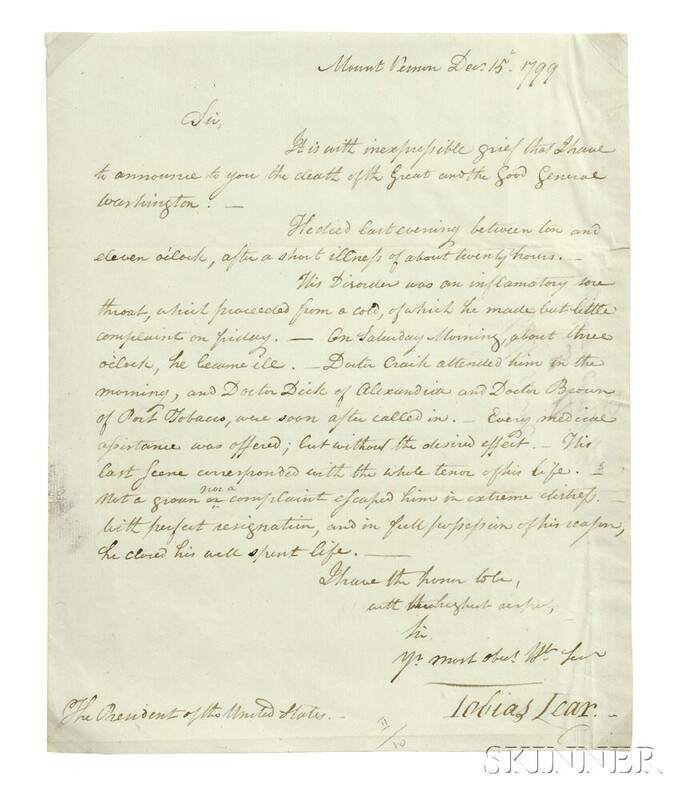 The Friends & Foundation of the Rochester (NY) Public Library may have some books that we would like to auction at the Fine Books and Manuscripts Auction 2014. What is the process and timeline for doing so? Hello, We are currently accepting consignment inquiries for our November 2014 Fine Books & Manuscripts auction. Please send a list of books to books@skinnerinc.com.